AR-10 308 AR Compatibility Reference Guide – Note this page will be a work in progress. For the benefit of visitors the decision was made to publish upon creation and keep updating. This website was born in 2006 as an attempt to bring some clarity to the confusion that surrounded the Armalite AR-10, DPMS LR-308 and Rock River Arms LAR-308 rifle platforms. These three brands were not the only 308 AR/AR-10’s at the time but they did dominate the market and the majority of the questions here and on the forum. Today the AR-10, 308 AR landscape has changed tremendously. Armalite now offers the AR-10 in it’s preban configuration compatible with DPMS LR pattern magazines or more importantly Magpul LR magazines aka “308 PMAGS”. DPMS has modified the LR-308 several times. DPMS recently released the innovative DPMS GII which downsizes the LR-308 and brings it closer to the AR-15 in size and compatibility. Not to be outdone Mega Arms also has their own version of the G2. The big change though as we predicted in 2006 shooters would seek out a rifle more powerful than the .223/5.56 AR-15 and what better choice than the father of the AR-15, the AR-10 (308 AR, AR308). Today nearly every AR-15 manufacturers now offers a .308 Winchester offering with many also including other short action calibers such as the 6.5 Creedmoor in their product mix. We had hoped that by now 308 AR/AR 308 designs would have standardized. That is simply not the case. Unfortunately the opposite is true. The AR-10/.308 AR market is now saturated with hardware. In an effort to differentiate themselves rifle manufacturers are taking substantial creative and artistic liberties in their designs. All these changes made us realize a reboot of sorts was in order. There are simply too many .308 AR/AR-10 brands and model variations for us to know every detail. We will now publish what we know as we learn it in a dynamic fashion. This page will grow to a series of pages. We encourage visitors to share what they learn as well as ask questions. Be patient with the questions as we are a small staff. If your need is urgent and you do not get a prompt response please ask on the forum and share the results back here on the main site. Anything 308 related is massively bigger than AR-15. While the DPMS GII bring the sizes closer they can never be equals. This is simple math. 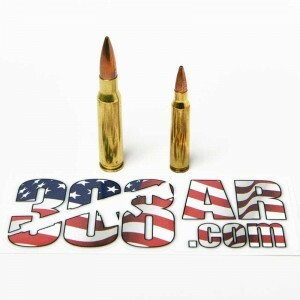 The .308 Winchester Cartridge is substantially longer than the .223/5.56. See for yourself. Safety Note: If your reading this page with the intent on building your own AR-10/.308 AR or upgrading a factory rifle it’s best if you have familiarity and prior experience with the AR-15 platform. As you can see in the picture an AR-15 lower receiver is substantially physically smaller than a 308 AR and AR-10 lower receiver. A DPMS GII is sized in between the AR-15 and AR-10. When this site first started back in 2006 or so we mostly had to contend with three different 308 AR platforms. The Armalite AR-10 (two types) DPMS LR-308, Knights Armament SR-25 and Rock River Arms LAR-308. The other major brands at the time Fulton Armory, JP Enterprises and SI Defense (now Falkor) were all DPMS compatible as were the newcomers like Mega Arms. These days it’s a different world as there are many dozens of companies producing 308’s. A vast majority of these guns can be considered DPMS compatible as nearly all use the Magpul LR magazines standard, DPMS barrel style extensions and bolt carrier groups. With that said today there is a lot of creative design liberties. These liberties can be classed as cosmetic, proprietary or both. Shooters find out the hard way that if they want to add an additional upper or lower to their existing rifle that they are stuck with the same brand. DIY guys take notice! If you like to swap parts a lot especially adding additional uppers you should investigate your options in advance. I typically suggest Mega Arms and Aero Precision as safe buys with easy to get uppers and lowers. Lastly is anyone has any info on brand compatibility drop us a message. The 308 Bolt Carrier Group is a critical difference between the platforms. 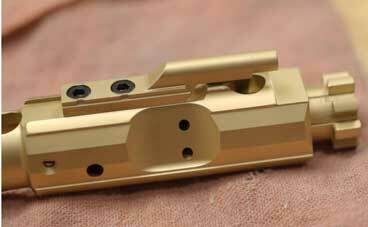 We do not believe in mixing different bolt carrier group parts to make them work with a platform they were not intended to. Currently we have multiple incompatible 308 bolt carrier group designs. 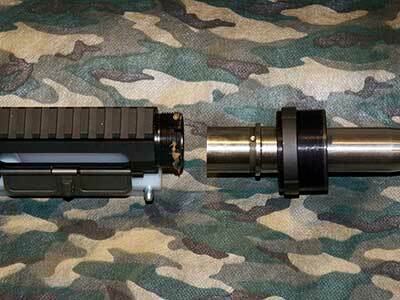 POF 308 Bolt Carrier Groups utilize a roller bearing design can only be used in POF 308 Rifles. DPMS GII Bolt Carrier Group Is a brand new design and it’s unknown if it will work with other similarly sized weapons such as Mega Arms. A few notes of caution. In years passed the 308 AR/AR-10 bolt carrier groups were often the most difficult part to obtain and constantly in a state of shortage. Today there are dozens of companies eager to fill the void. Some BCG’s are very good while others are total junk. Key to personal safety, reliable function and repeatable accuracy is a properly locked bolt. Do not buy based on price alone. Please have a gunsmith verify headspace or check it yourself with a set of quality headspace gages. The number one issue we hear about is rifles that don’t cycle properly and the cause is often the inferior bolt carrier. 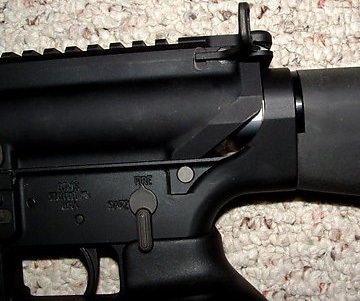 The DPMS pattern barrel extension is the most common. This translates in to many 308 AR barrel options. RRA LAR 308 will also work with a DPMS barrel. The Armalite AR-10 barrel extension is not dimensionally identical to the DPMS. Therefore Armalite AR-10 rifles must use barrels designated for the Armalite AR-10 and vice versa. This is where it gets confusing. Some vendors and 308 barrel manufacturers incorrectly refer to all things .308 as “AR-10”. This is misleading to put it mildly. fortunately in their specifications and fine print most website will specify actual platform compatibility. If you don’t see the information call the company or drop them a message. If you learn anything share the information with us. 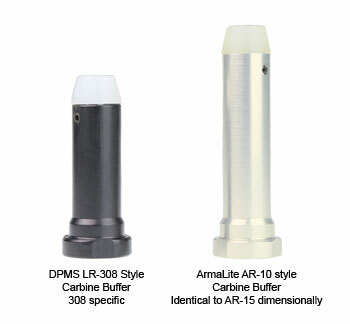 Some aftermarket 308 barrel companies offer both AR-10 and DPMS platform. Specify and order carefully. The barrel nut and upper receiver threads follow along the same lines as the Armalite AR-10 and DPMS pattern differences. The manufacturers use two different threads. Reports are some newer manufacturers are possibly using proprietary barrel nuts but we have not confirmed this as of yet. Note: when we refer to the barrel nut threads we are referring to the internal threads. The external threads are a function of specific handguard mounting and have nothing to do with barrel installation. The 308 AR, AR308 and AR-10 Recoil System is easily the most difficult part of the 308 AR/AR-10 platform to understand. The reason for this confusion is there are significantly different ways to achieve to same goal. That goal is safe and proper function with minimum recoil. The recoil system consists of the following three components. Receiver Extension Tube also know as the Buffer Tube. This is the long black tube that internally houses the Recoil Buffer and Recoil Buffer Spring. Externally the buffer tube secures the buttstock to the rifle. 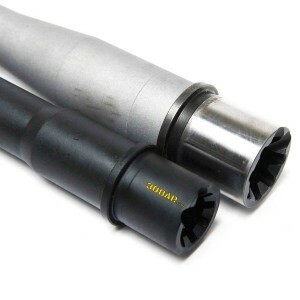 Generally speaking there are two classes of receiver extension tube, Carbine Length and Rifle Length. There is also an option for “Commercial” and “Mil Spec”. Always choose Mil Spec. Buffer – The buffer is the cylindrical weight held captive by the buffer spring. The buffer is also the interface between the buffer spring and the bolt carrier group. Our friend and former Armalite Armorer Pat Raley provided us with this explanation. Click to review complete Armalite M-15 and AR-10 Buffer dimensions and part numbers. DPMS uses an AR-15 receiver extension with a short .308 specific buffer and .308 specific buffer spring. Another crucial difference between the Armalite AR-10 and the both the AR-15 and 308 AR/AR 308 is the rifle length gas system. Armalite uses a gas tube that is approximately .325″ longer than an AR-15’s or nearly all 308’s. In addition to Armalite, Futon Armory also uses the AR-10 rifle length gas tube. All parts of this Compatibility Reference Guide are important but magazine compatibility is certainly near the top of most important (and confusing) details of the various 308 rifles. By now you the reader understands that a .308 Winchester rifle cartridge is too long to fit an AR15 magazine or receiver. No further discussion needed. Now things get complicated. Let’s begin with Armalite. 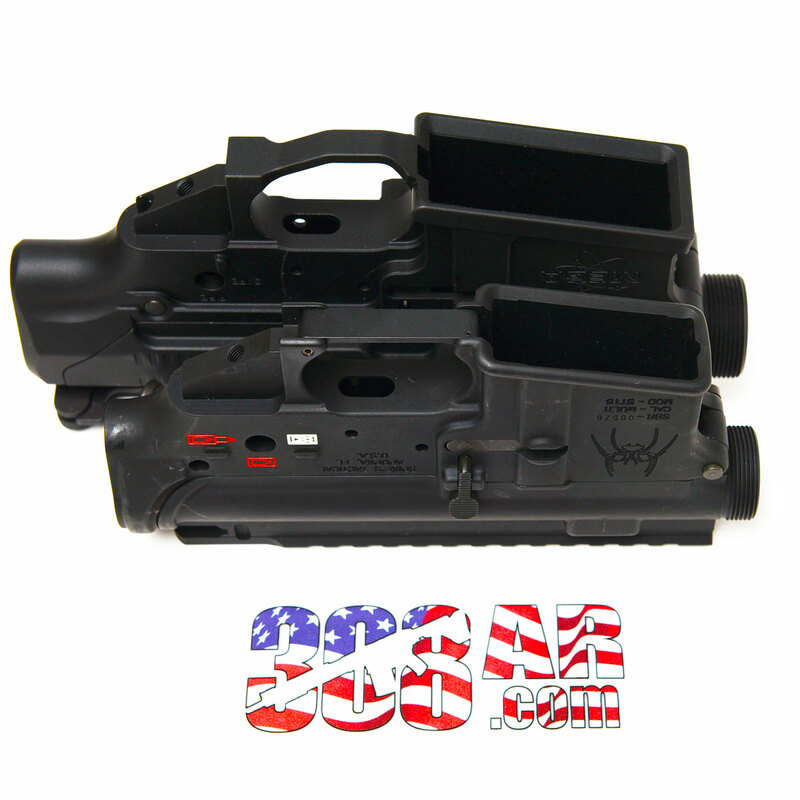 Armalite offers two style lower receivers, AR-10A and AR-10B. Armalite use two different magazine types. The Armalite AR-10A uses the original “waffle” magazines. The Armalite AR-10 waffle magazines are now ancient history. Today the Armalite AR-10A ships with the common Magpul LR 308 PMAGS. These are considered to be “DPMS/KAC SR-25” compatible magazines and as close to an industry standard as we have. It should also be noted that the “DPMS/KAC SR-25” magazines are in fact the original AR-10 and 308 AR magazines. AR-10B magazines are Armalite specific. 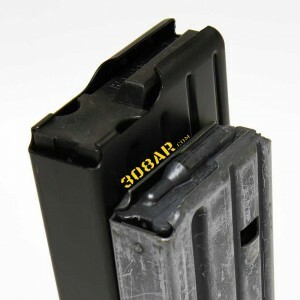 The AR-10B magazines are based on M14 magazines and came to be the Armalite standard due to availability during the Clinton era assault weapon ban. Read the AR-10A versus AR-10A page. While the AR .308 rifles may not have a milspec designated magazine to keep things simple they do have one magazine style that has become predominant. The DPMS 308 style magazine is unquestionably the most universally accepted magazine for 308 AR. Basically unless you have an Armalite AR-10B or a RRA LAR 308 there’s a 99 percent likelihood that your 308 uses the DPMS/SR-25 magazine. 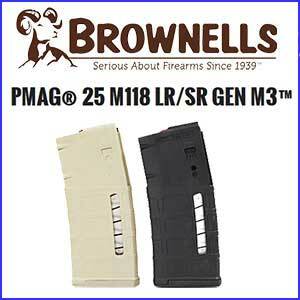 Other than DPMS who uses their own steel 19 round magazines most everyone else standardized on the Magpul 308 PMAGS. BTW thats a good thing. The Magpuls are typically ultra reliable and half the cost of DPMS branded magazines. Question: Is a Rock River Arms (RRA) LAR-08 a DPMS Pattern 308 AR? Answer: No, Rock River Arms LAR-308 Rifles are a proprietary design. Question: Can I use an AR-15 Upper Receiver on an AR-10 Lower Receiver? Answer: No, Armalite AR-10 and DPMS LR-308 (308 AR, AR 308) pattern Lower Receivers are substantially larger than an AR-15 Lower Receiver. Question: LR-308 vs AR-10? Answer: DPMS LR-308 is a model designation of the DPMS Panther Arms 308 AR/AR 308 Semiautomatic rifle. The LR-308 is also frequently referred to as DPMS/SR-25 Pattern. AR-10 is the model designation of the Armalite AR-10 large frame 308 AR/AR 308 class of semiautomatic rifles. Both rifle platforms share many parts but they are not completely interchangeable. Confusing the answer many shooters refer to all 308 AR/AR 308 rifles as AR-10. This would be like stating all polymer framed 9mm handguns are Glocks. Question: How do I build an AR-10? Answer: Read our AR-10, 308 AR Rifle Build Guides. Question: What is the difference between an Armalite AR-10 Rifle Length Gas Tube and an AR-15 Rifle Length Gas Tube? Answer: The AR-10 Gas Tube is .354″ longer than that of an AR-15, 308 AR and AR 308. Fulton Armory FAR-308 Rifles use an AR-10 Rifle Length Gas Tube on applicable models.